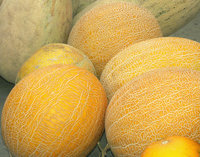 Melons are gorgeous and these varieties are suited to the British climate - you will need to grow these under glass or with some other protection to get the best of results. A slight challenge but who knows with our hot summers! A mini galia type reaching 700-900g (thats 1.5-2 lbs) which could be your perfect choice for a sunny patio and trellis (or greenhouse). Its small leafed vines are rarely longer than 2m so very manageable. Lovely globe fruits ripen to yellow with tan netting and have an excellent flavour.